Please note: I corrected a mistake in the last 2 rows of the pattern on Jan. 7, 2018. If you printed or saved this pattern in any way before then, please re-print or re-save it so you have access to the correction. Thank you! Learn how to knit Sways with the Wind – my new pattern to knit a simple scarf! I was inspired to design a scarf pattern amidst a sea of news about sexual misconduct. I know these two don’t seem to be related, but I promise you that they are. Stay with me. Here in the United States, the topic of sexual harassment, abuse, and violence has been inescapable for the past month or so. But what has bothered me increasingly with every news story I’ve read is knowing that millions of women live quietly with the pain of their humiliations and assaults every day. Without splashy headlines, without breathless television coverage. Here’s something I have learned since I devoted a large portion of my life to charity knitting. 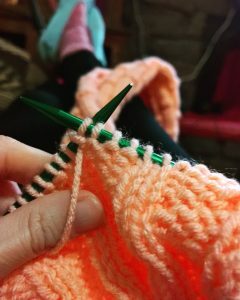 If I can’t get some sort of injustice or issue or awful set of circumstances out of my head, it’s a signal that I should be knitting for it. That led me to consider Threads of Compassion. 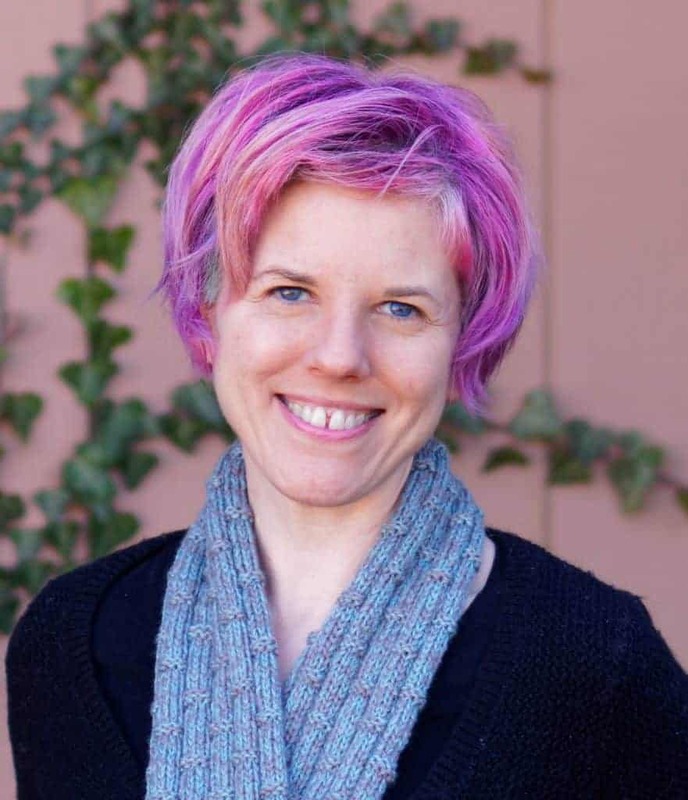 This charity knitting organization offers comfort to victims of sexual violence through hand-knitted or crocheted scarves. That, in turn, made me want to knit a simple scarf! I wanted to knit a simple scarf that would be soft and warm and cuddly. A way to reach out and hug someone without actually being able to do so. And that led me to my favorite stitch dictionary (thank you again, Eric, for a terrific birthday gift!) to find just the right stitch pattern. In my stitch dictionary, I found something called a bamboo rib stitch. And I instantly knew it was perfect. It’s a simple stitch pattern, easy to memorize, yet with enough variety to hold my interest. In other words, even the thinnest stalk of bamboo can avoid cracking in the strongest storms, because its flexibility is its strength. Inspired by this symbolism, I knew that this bamboo stitch was the perfect choice. I’ve named this pattern Sways with the Wind, inspired by the Bruce Lee quote. I just love this pattern’s simplicity. You won’t do anything unusual here; every stitch is either a knit or a purl. No increases or decreases, no yarnovers, no slipped stitches. A total beginner should be able to knit this scarf with no problem. Gauge isn’t really that important for this pattern, but you’ll definitely want to use a worsted weight yarn. This is especially crucial if you’re knitting for Threads of Compassion, as they call for scarves at least 5 inches wide. You will find this a very relaxing knit. Row 1: *P2, K4; repeat from * until last 2 stitches, P2. Row 2: *K2, P4; repeat from * until last 2 stitches, K2. Rows 3-4: Repeat Rows 1 and 2. Row 5: *P8, K4; repeat from * until last 6 stitches, K4, P2. Row 6: *K8, P4; repeat from * until last 6 stitches, P4, K2. Rows 7-10: Repeat Rows 1 through 2, twice. Row 11: P2, K4, *P8, K4, repeat from * to 8 stitches from the end, P8. Row 12: K2, P4, *K8, P4, repeat from * to 8 stitches from the end, K8. Almost there! Check out the lovely rounded edges. Repeat Rows 1-12 until the scarf is at least 65 inches long (if you’re knitting for Threads of Compassion) or as long as you need it (if you’re knitting for someone else). Bind off; weave in ends and block lightly, if desired. Once you get the hang of this pattern, you’ll find it’s quite intuitive. 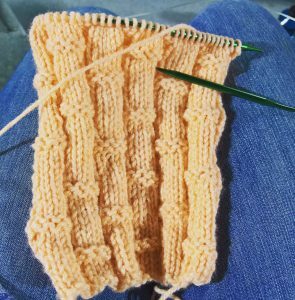 It’ll be especially easy if you’re able to count your knit rows, because then you’ll know to add a purl ridge to each “stalk” of “bamboo” after 10 knit rows. What I love the most about this pattern is its rounded edges. Because the edges curl (thanks to the stockinette stitches at each end), the whole scarf has a rather cylindrical appearance. Be sure not to block the scarf too aggressively if you want to maintain that cylindrical appearance! As you can see, I knit this scarf mostly in a peachy shade, but I’m looking forward to trying it in a green. I added gray to each end (because I ran out of peach yarn, ha!) and then used gray fringe to complete the scarf. Knitting a Sways with the Wind Scarf? Please Share! If you knit this simple scarf pattern, I’d love for you to share photos! You can share links to your photos in the comments, or you can visit my Facebook page or community and post photos there. I’ve also set up a Ravelry pattern page so you can link your project to my pattern there, if you’d like. 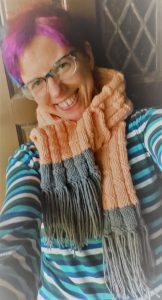 While I created this pattern especially for survivors of sexual assault, I encourage you to knit this scarf for anyone you want! Knit it as a gift for someone special, or knit it as a charity project for any organization you want. Let me know in the comments if you think you’ll be knitting this simple scarf in the future! Already a subscriber? Then click here to enter the Free Resource Library and use your password! 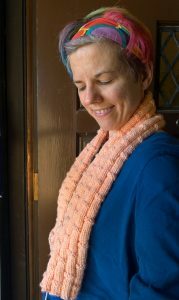 Also, if you like this pattern, you’ll love my patterns eBook Swaying with the Wind: a Charity Knitting Pattern Collection. You’ll get more patterns with this unique stitch pattern, featuring a total of 18 different variations. You’ll also get beginning knitting video tutorials and a list of charities that will accept every pattern in the collection. Get your copy of Swaying with the Wind today! So lovely,makes me want to drop what I’m doing,and make this. Oh, I might have the perfect yarn in the stash for it too! That’s a high compliment indeed, thank you! I can’t wait to start the bamboo stitch scarf! And I just got a coupon for on-sale yard in the mail. I may keep the first o e for myself.